River basin monitoring is essential for knowledge- based water resources planning, efficient water resources management, socio-economic development, and environmental sustainability. The current system of Nile Basin monitoring is inadequate where many significant hydrologic portions of the Nile Basin are either un-gauged or very sparselyt gauged even with respect to basic hydrological parameters. To address these critical gaps and improve transboundary water resource collaboration, the NBI worked with the NBI riparian countries to develop design specifications and an implementation plan for the Nile Basin Regional Hydro-meteorological Monitoring System. Based on the individual country inclusive assessments, it was clear that each of the riparian countries had the requisite institutions established for monitoring, but that the level of professional depth and breadth of training and staffing varied, as did the hardware and software available for collecting and managing the data and actual parameters being measured. 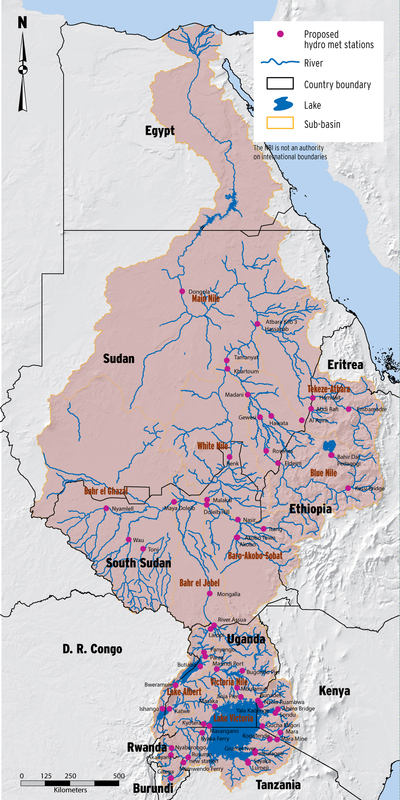 The most important gaps identified and addressed in the development of the Nile Basin Regional Monitoring Network are: significant number of stations that are outdated and out of service, inadequate equipment calibration, limited or non-existent telemetry systems, lack of adequate or modern data acquisition and management systems, and weak national water quality, groundwater and sediment monitoring programs. Recognizing the importance of a functional Nile River Basin Monitoring System, NBI developed the design of a regional hydromet system that addresses the severe gaps, responds to the strategic water resource management issues that had direct bearing on the socio-economic developments within the basin, builds on existing networks – including those of IGAD-HYCOS Program – is based on international guidelines and best practices, and considers national needs and limitations. The meteorological network design was driven by the spatial distribution necessary to capture the meteorological variability within the basin. A total of 322 meteorological stations are proposed for the regional network of the Nile Basin. This includes 227 stations to measure a full suite of meteorological parameters and 95 to monitor rainfall only. The full meteorological (Full Met) stations include instruments to measure precipitation, wind, air temperature, humidity, barometric pressure and solar radiation which allows for the calculation of evaporation. Hydrological Network Design The primary purpose of the existing hydrometric stations for the regional design would be for measuring streamflow at rivers and water level at lakes. In addition, the hydrometric design also includes locations by water quality and sediment monitoring, which typically aligns with streamflow gauging locations. The regional design proposes monitoring of both basic and advanced water quality parameters. The Nile Basin hydrometric design focuses on achieving the monitoring of transboundary water management issues. A total of 79 hydrometric stations are proposed for the regional network of the Nile Basin.